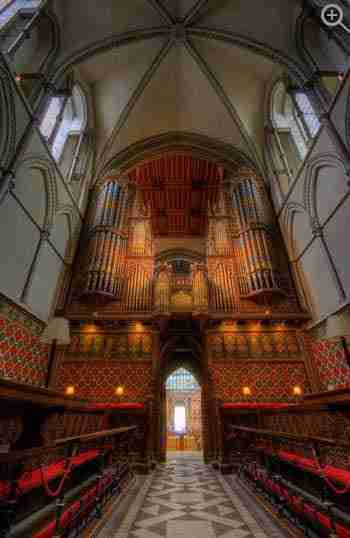 The Walker organ of 1905 forms the core of the new 4 manual organ in Rochester Cathedral. The instrument is placed within the splendid Gilbert Scott cases of 1875. Approximately 50% of the Great, Swell and Pedal pipework dates from 1905, the rest is new. A new Choir case, designed in matching style by Didier Grassin, was added to enclose the new Choir Organ division with stenciled front pipes to match. The Great and Swell Organs are contained in the North case, and the console faces them, with the larger Pedal wood pipes underneath, within the screen. The Solo and Pedal Organs are contained in the South case, including the new 32ft reed. In 2016, due to the collapse of the old plain metal Swell Contra Fagotto, Trumpet and Clarion pipes, new spotted metal reeds were made to replace them. Their “freer” tone is intended to be more in keeping with the new Great reeds of 1991.